Kathryn Alford Parker, 89, died Saturday, January 19, 2019 at Madison County Nursing Home. Visitation will be at Breeland Funeral Home on Tuesday, January 22, 2019 from 11:00 am until the 1:00 pm chapel service. Burial will be at Canton Cemetery. 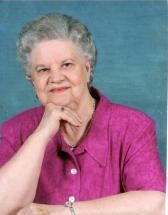 Mrs. Parker was a member of Fellowship Christian Assembly of Canton. She was preceded in death by: parents, Bud and Eva Alford; husband Edman Parker; and son, Reggie Parker. Survivors include: son, Barry Parker (Cynthia) of Canton; daughter, Ginger Parker Monk of Canton; grandchildren, Melissa Parker Adams (Trestan) of Brandon, Kate Parker Harris (John) of Gluckstadt, and Robert Denver “Rob” Parker (Chandler) of Canton; and great grandchildren, Eva Adams, Parker Harris, Cooper Harris, and Banks Parker. In lieu of flowers memorials may be made to: Fellowship Christian Assembly. A guestbook is available at breelandfuneralhome.com.